Are you ready to help your students succeed in a digital testing environment? Then check this out! 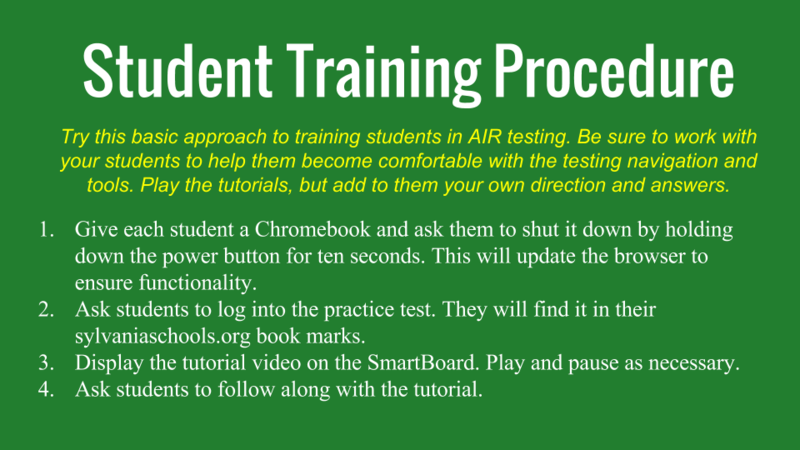 Teachers will use AIR’s tutorial #1, “Sign-in and Navigation Tutorial,” to help students master signing-in and navigation. Teachers will use specific tutorials found below to help students master content-specific tools. Students can use the “Student Practice Portal” to access a practice test and follow along during teacher instruction. If you participated in student training during the 2014-2015 year, you will find this program and its videos familiar. Consider what worked for you and your students last year. Click on a button below for the video link. The following tutorials provide specific guidance on the tools and question types unique to a specific tested area.